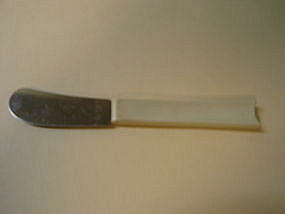 Vintage cheese spreader marked as Quikut Stainless. It measures 5 1/2 inches in length. There are some usage marks to the blade. There are 3 available and priced individually. I need your zip code to calculate the postage.